This course will teach you how to use the Classic Editor in WordPress 4.9 or older to create or manage your own business website, hobby blog, or any other type of site you want. Ready to get started? 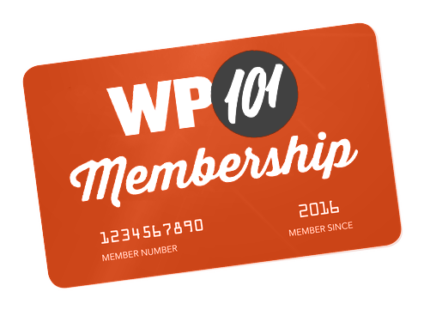 This is the original WordPress 101 video tutorial series that has helped more than two million beginners learn how to use WordPress. These videos are for the Classic Editor in WordPress 4.9 and older. After taking this course, you'll know how to use WordPress to create or manage your own business website, hobby blog, or any other type of site you want. The videos are best viewed in order, since each one builds on concepts from the previous videos. To get started, simply scroll down and click the first few lessons below to start learning for FREE. Then, unlock the rest of the course with an All-Access Pass — which includes every course on this site! In the first video in this series, take a tour of the WordPress administration panel, which provides access to all the functions and features of your WordPress-powered website. A detailed look at the WordPress editor toolbar, which is used for editing posts, pages, and other types of content in WordPress. This tutorial video takes a detailed look at the various Post Formats in WordPress, which enable you to create specific types of posts, each one with its own unique style. This tutorial video shows you how to edit an existing post in WordPress using either the Post Editor or the Quick Edit tool. This tutorial video demonstrates how to use categories and tags in WordPress to make it easy for your readers to find related content on your site. This tutorial video demonstrates how to create a new static page in WordPress, or edit existing pages in your site. How to add visual interest by inserting photos or images into your pages or posts in WordPress. How to embed video and audio files in WordPress pages and posts, including tips and best practices. How to use the Media Library to manage and upload files (like images, PDFs, or Word documents) for use in your WordPress posts and pages. Enabling and moderating comments on your WordPress site, including tips and best practices to encourage discussion with your visitors. How to create image and text links to other pages on your own site, or to 3rd-party sites elsewhere on the web. How to find and install a new theme for your site, or use the Customizer to change the look of your site. What are widgets? In this video, you‘ll learn what widgets are and how they can be used to easily add blocks of content to your site‘s sidebar or footer. This video demonstrates how easy it is to build and edit custom navigation menus, including drop-down menu items. This tutorial video will show you how to install WordPress plugins to add new functions and features to your WordPress site. How to add new users or multiple authors to your WordPress site, and assign different roles and permissions. How to properly configure the settings to optimize and get the most out of your WordPress site.